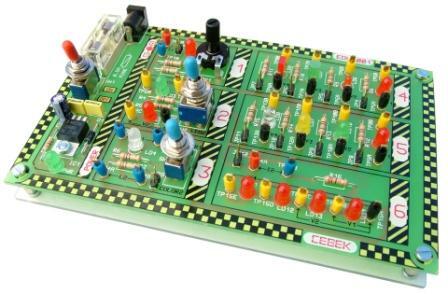 The EDU series of educational modules from Cebek offer the student the chance to experiment, analyse and learn the basic knowledge of the chosen electronic theme. Their function is to complement the work of the teacher as well as to allow the experimentation of a theoretical theme evocated by the teacher. The comprehensive manual supplied with each module gives detailed information about each experiment and circuit diagrams. Guidance notes for the teacher are provided including operating characteristics, formulas and principles for each component used in the experiments. Cebek EDU-001 is a mini-laboratory with 6 experiments based on the operating modes and performance of LED's (Light Emitting Diodes).